This season has been rough. I was under a lot of stress in the spring in various other aspects of my life and like Tita’s emotion-infused cooking in Like Water for Chocolate, I believe it had an impact on the farm. The erratic weather (a week in the high 80s, rounds of 2-3 inches of rain over two days followed by 7 dry days…) and an influx of animal pests displaced by road and sewer constructions throughout our neighborhood didn’t help either. And so, it isn’t surprising that I haven’t posted much in this space. I didn’t feel like I had much to celebrate. Thankfully my friends and loyal CSA supporters have assured me, repeatedly, that they’ll support our work when times are good and when they’re not so good. They understand that that’s what community supported agriculture means. When the harvest is good, it’s great, and when it’s ain’t, it ain’t. I suppose you could say part of what members received in their share this season was emails from me outlining the challenges we faced, as we faced them. I like to think of this as the “get to know your farmer” bonus CSAs and farmers’ markets provide. With all this going on, I had no idea two months had gone by since I posted here! And, in retrospect, it wasn’t all bad. Here are some highlights. 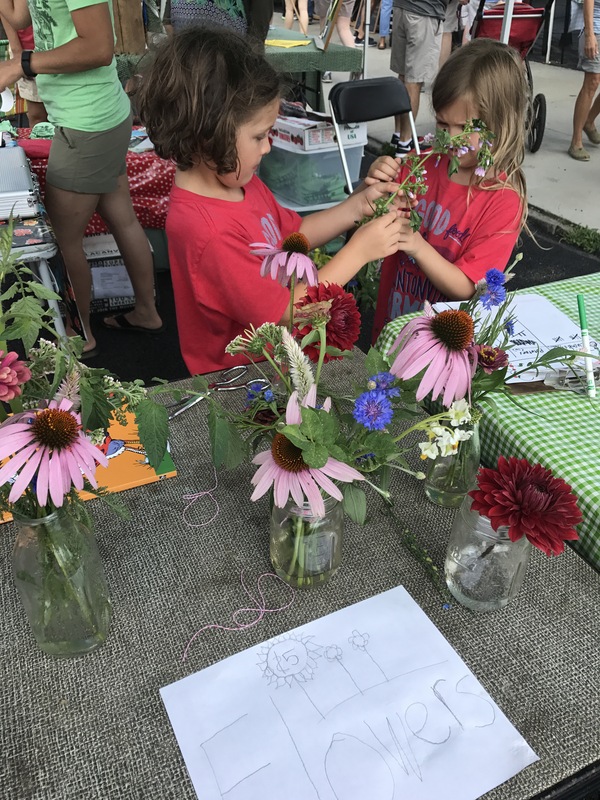 The Clintonville Farmers’ Market Kids’ Garden Club continued their meetings, field trips (Franklinton Farms and Rock Dove Farm), and had two great sales at the farmers market. They raked in over $100 which we’ll split between their harvest party and a donation to a yet to be determined local nonprofit. Edible Columbus featured me in the Local Hero column. It was great to run into people throughout the summer who saw the article. Made me feel almost famous. And appreciated. We have a bunch of events coming up in September including the Simply Living Sustainable Living and Garden Tour – an answer to the wish my friends and I had for such an event in the spring after visiting the mainstream H&G show at the fairgrounds (see Follow-up on The Columbus Dispatch Home and Garden Show). We’ll also be celebrating the beauty of small scale agriculture at Global Gallery September 14th for a reception celebrating “In the Footsteps of a Farmer: Fleeting Beauty,” a photo exhibition sponsored by an Greater Columbus Arts Council Artists in the Community grant. Thanks for sticking with us in the good times, and the not so good times. Categories: In the Footsteps of a Farmer, Young Folks on the Farm | Tags: Clintonville Farmers Market Kids Garden Club, Edible Columbus, Farmer Thoughts, GCAC, Global Gallery Columbus, In the Footsteps of a Farmer, Kids Garden Club, Local Hero | Permalink. The Clintonville Farmer’s Market Kids’ Garden Club returned to the farm last night after a week off site for a field trip to Chadwick Arboretum. The kids (and their parents) were amazed to see how much things had grown in two weeks! We broke into three groups and rotated between tasks – weed/seed/feeding in the garden, making soil blocks and planting winter squash seeds, and painting signs. It was a productive meeting, and we’re all looking forward to our first sale at the market on July 7th! Come find us at the CFM booth on Dunedin. Categories: Young Folks on the Farm | Tags: C, Clintonville Community Market, Kids Garden Club, Kids in the Garden, Strega Nona's Harvest | Permalink. Members of the Clintonville Farmers’ Market Kids Garden Club came to the farm today to celebrate Earth Week and get the garden ready for the 2018 season. Here’s a few scenes of the garden before we got started. One of my goals for the event was to move the fence from the edge of the raised beds to the space beyond them. This will provide the kids a lot more growing space and room to move. With the help of a few handy moms, we got that job done. Now the kids have a bigger space to grow, and the chickens have better boundaries. The kids cleared the straw blankets that were sheltering the soil over winter and spread compost all over. Then they played around with the broadfork. We planted some seeds even though though my go-to garden calendar said it wasn’t a good day for it. We aren’t due to start regular club meetings for a few weeks. I’m hopeful that Persephone will look kindly on our efforts and the kids will have some seedlings to welcome them back. Categories: Scenes from the Field, Young Folks on the Farm | Tags: Clintonville Farmers Market Kids Garden Club, Compost, Earth Week Columbus, Garden Prep, Green Columbus, Kids Garden Club, Kids in the Garden, Over the Fence Urban Farm, Persephone, Price Farms Organic Zoo Brew | Permalink. Kids’ Garden Club: Sold Out! The Clintonville Farmers’ Market Kids Garden Club sold out their first market booth this morning! We brought a few pounds of new potatoes, a dozen or so cucumbers, bouquets of flowers and a few purple green beans (just for sharing as taste tests). The kids raised $50 which we’ll spend on provisions for an end of the season harvest party. We organized the morning into three shifts – one hour each with two kids working each hour. It worked out well, no one had any meltdowns, no one got lost, all the kids got to interact with customers and one another as they learned new things, and we had fun! I brought a bunch of activities to keep us busy. and buckets of flowers, jars, scissors, and string so they could arrange bouquets. We discussed how to greet customers, did lots of addition and subtraction to figure out sales totals and make change, and thanked everyone with a smile. We’ll work on a few of these a little more before our next sale. We’ll be back at the market August 19th. Come see us! 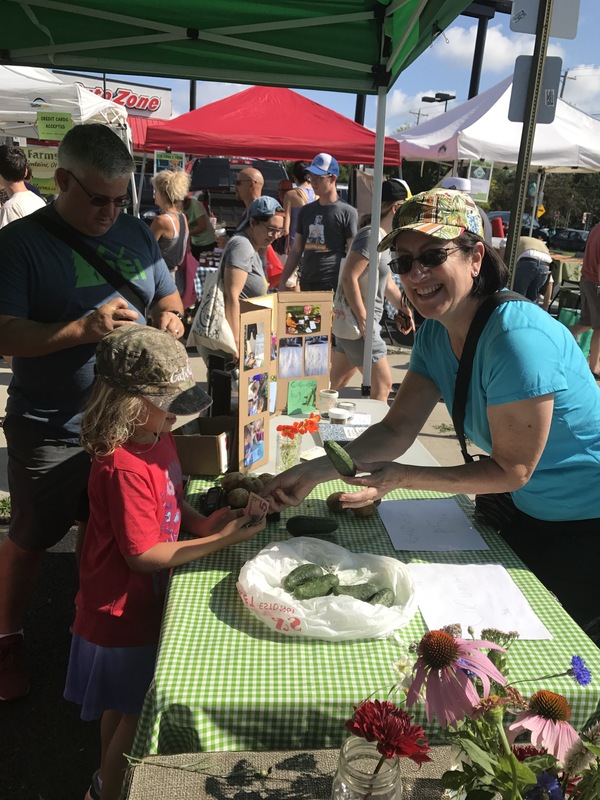 Categories: Young Folks on the Farm | Tags: Clintonville Farmers Market, Clintonville Farmers Market Kids Garden Club, Columbus Urban Farmers, Cucumbers, Cut Flowers, Kid-Grown, Kids Garden Club, Kids in the Garden, new potatoes, Urban Farms of Central Ohio, Young Enrepreneurs | Permalink. The Clintonville Kids Garden Club has been chugging along. So far we’ve talked a lot about weeding, seeding, and feeding as well as working with what you find at your site, including volunteer plants and the bounty they offer with minimal effort. Two weeks ago the kids harvested 3 pounds of potatoes from plants that came back from last year within the bounds of their garden. This week, we harvested seed from an overwintered cilantro plant. As we collect things, we discuss how we might sell them at our first market day – July 15th. This week we had a pretty small group. The girls who were with me harvested a nice bunch of cucumbers. They had a snack at club and took a few home to share, maybe, with their families…. Here they are harvesting cilantro seed. We talked about how amazing it is that one little seed made this plant, which produced so many more seeds! We also talked about selling packets of these seeds and encouraging people to plant them now. It’s never too late to “seed” afterall! After some weeding, feeding, and seeding (radish, beets, and squash), the girls and I made some line drawings of flowers we’ve been growing. We hope to get a little coloring book together to sell at our stand. Everyone went home with a small bouquet. Categories: Young Folks on the Farm | Tags: #learninggardens, 614farms, cilantro seed, Clintonville Farmers Market Kids Garden Club, Cucumbers, Cut Flowers, flower drawing, Kids Garden Club, Kids in the Garden, Seed SAvers | Permalink. This year we’re hosting the Clintonville Farmers’ Market Kids Garden Club. I’m excited to be working in the soil with kids–seeing what works with little hands and lots of little bodies and what doesn’t. The club currently has 8 members and we’ve had two meetings so far. We’ll be meeting formally ever other week, with some informal meetups and effort by Cora and other kids from our CSA in between to keep things growing. I have made a pact with myself to not work in the garden without at least one child present aside from watering. Here are a few highlights from this week’s session. Upon arrival, all members, including our youngest age 4.5, sign themselves in. This small gesture is a first step in giving the kids ownership of their time in the garden. As I was setting up and getting my head together for our time together, I thought about how to bring the kids who missed the session (5 of 8!) up to speed on what they missed. I pulled out a composition book and started a garden club log. We’ll use this to keep track of what we do each session and I’ll record anything that happens when they are not around in the journal to give them a sense of what’s happening when they aren’t around. Each week, during our welcome time, we’ll review what happened the previous session and the interim. Here’s an excerpt of what I wrote for Week 1. The next pages included lists of everything we planted: transplants, seeds, and the volunteers we found on the site. After the review, we went over the days agenda which I’ve been writing on a white board. I planned for us to weed and then label plants but the moment we stepped into the space I realized that was backwards. We sat back down and the kids enthusiastically made labels to mark the plants we already had in place. Then we went back inside the gate, reviewed some of the common weeds we found – grass, sorrel (which we tasted and left a bit around for future snacking, and ground ivy. We adopted a weed, seed, feed mantra for our work sessions. So, following some light weeding session, we spread compost and dug some fertilizer in around the tomatoes. We also planted a few seeds we hadn’t gotten in the ground the week before. We ended the session with a scavenger hunt over the fence on the farm. The kids got to pick and taste a spectrum of things from sweet strawberries to spicy radishes. Not surprisingly, there were mixed reviews. Categories: Scenes from the Field, Young Folks on the Farm | Tags: 614farms, Clintonville Farmers Market Kids Garden Club, Developmentally appropriate envrionmental education, Ecoliteracy, Environmental education, Garden Scavenger Hunt, Graden journal, Kids Garden Club, Kids in the Garden, Learning Garden | Permalink.